Are you looking for a unique, versatile and relaxed environment to hold your next function? Terms and Conditions: A minimum of one week’s notice is required for any function. A 30% deposit applies to all functions which is required one week prior to function date. Confirmation of your booking and final numbers are required two days before function date. 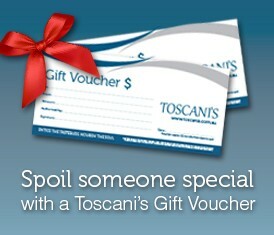 Toscani’s restaurants are fully licensed. No BYO for functions. Available at participating restaurants only. Minimum numbers may apply.